The first award of the 2014 NBA awards season goes to former Bull Luol Deng. Deng was named winner of the 2013-14 J. Walter Kennedy Citizenship Award. It is voted on by the 175 members of the Professional Basketball Writers Association, similar to the media group that votes for the NBA post season awards. The honor goes to a player, coach or trainer with a team who demonstrates outstanding service and dedication to the community. “Lu always has been a person who cared about the people and the community and the world around him and someone who devoted his time and efforts to make the world a better place,” said Bulls GM Gar Forman of Deng. The first winner in 1975 was Wes Unseld. Previous winners have included Dave Bing, Bob Lanier, Julius Erving, Dan Issel, Calvin Murphy, Isiah Thomas, Doc Rivers, Joe Dumars, Kevin Johnson, Vlade Divac, Dikembe Mutombo, Steve Nash, David Robinson, Alonzo Mourning, Reggie Miller, Pau Gasol and Samuel Dalembert. Deng officially won the award as a member of the Cleveland Cavaliers. But he was nominated and became a finalist while still with the Bulls as the award represents his community work during his NBA career. He was traded Jan. 7 after more than nine seasons with the Bulls, ranking in the top five in franchise history in seasons, minutes played, points scored, three-point shots, offensive rebounds and steals. 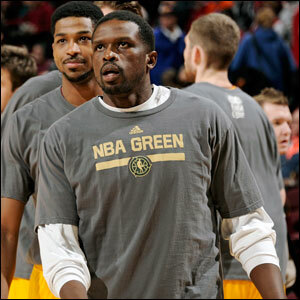 Deng played 23 games for the Bulls this season and led the team in scoring at 19 per game. Other finalists for the award named for the second commissioner of the NBA were Miami’s Ray Allen, San Antonio’s Matt Bonner, Oklahoma City’s Kevin Durant, Toronto’s Amir Johnson, Atlanta’s Kyle Korver, Portland’s Damian Lillard, Minnesota’s Kevin Love, the L.A. Lakers’ Steve Nash, Chicago’s Joakim Noah and the L.A. Clippers’ Chris Paul.